But how do they do it? That’s a sticky subject. Trevor Bauer of the Cleveland Indians has experimented in a lab with substances that could increase a pitcher’s fastball spin rate. 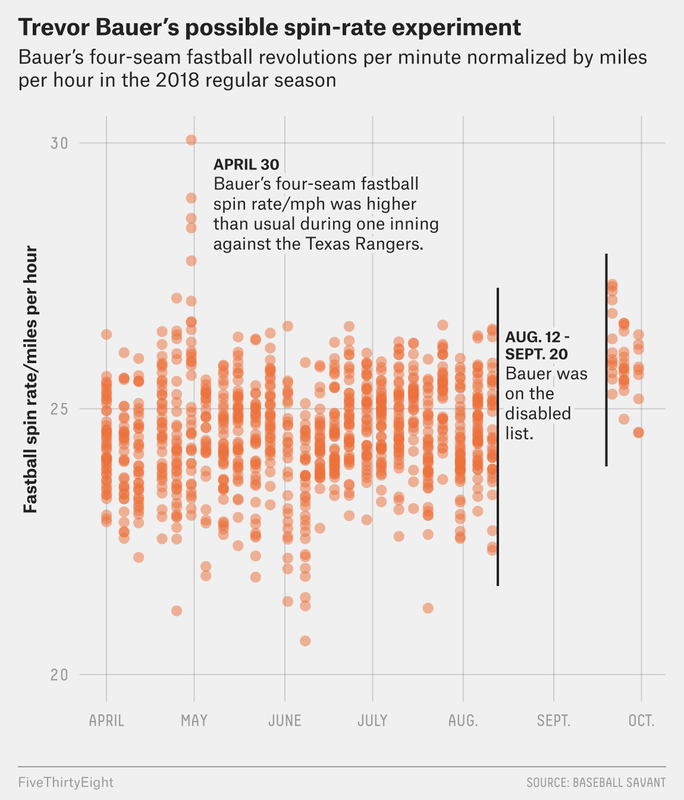 When baseball welcomed the new Statcast technology to every major league stadium in 2015, the system’s Doppler radar began tracking an underlying pitching skill: spin rate. Teams and players were suddenly armed with new data to study and optimize. They were able to quantify long-held beliefs about pitch characteristics, like “late life” and “rise,” and challenge established practices, like always keeping the ball down as a pitcher. As batters have adjusted their swings lower to crush the sinking fastball, more and more pitchers have sought to go up in the zone, above uppercut swing planes, with elevated fastballs. In every year of Statcast pitch tracking, the average height of four-seam fastballs upon reaching the plate has increased. And adding spin to the four-seam fastball is what makes it a bat-missing weapon. The teams that harness those high-spin pitches seem to have an advantage in getting to October: The Houston Astros, New York Yankees, Los Angeles Dodgers and Cleveland Indians are the top four teams in spin rate on four-seam fastballs, and the Boston Red Sox are ninth. Leaguewide batting averages offer a snapshot into the importance of spin. When pitchers threw fastballs between 93 and 94 mph with an average spin range of 2,240 to 2,300 revolutions per minute, hitters posted a .279 average this season. But against the same velocity range with an increased spin of 2,540 to 2,600 rpms, batting average declines to .255. The more spin a fastball has, the more it appears to rise and resist gravity, and that creates more swings and misses, as demonstrated by Jeff Zimmerman of FanGraphs. But how can a player — or a whole team — develop high spin rates? Some players have high fastball spin rates innately, and others don’t — changing grip on a breaking ball can change spin rate, but it’s difficult to throw a fastball differently. Unlike velocity, which can be trained, a pitcher’s fastball spin ratio is thought to be extremely difficult to alter naturally. The unnatural solution is for a pitcher to apply a foreign substance. In May, Cleveland Indians pitcher Trevor Bauer drew the ire of the Houston Astros when he addressed the subject of sticky substances and their effect on performance. When a thrown ball departs from a straight path, it’s because the speed of its spin creates a pressure differential. The ball moves toward the direction of lower pressure. In baseball, this phenomenon — known as the Magnus Effect — combines with the orientation of the ball’s spin axis to force a curveball to break downward and a slider to move more laterally. More spin equals more movement. The Magnus Effect forces a four-seam fastball in another direction: up. Just about every four-seam fastball is thrown in a similar manner, with the index and middle fingers of the throwing hand last making contact with the ball. Bauer, who’s known for taking a scientific approach to pitching, explained that to increase spin on four-seam fastballs, the pitcher’s fingers must maintain contact longer to form a more acute tangential angle with the ball. Bauer believes this is largely an innate trait — unless a sticky substance helps the fingers adhere to the ball for a fraction of second longer. University of Illinois physics professor Alan Nathan, an MLB consultant, agreed with Bauer’s theory. It seems like Bauer tried to prove his point with an on-field experiment. During the season, Bauer ranked 164th out of 495 pitches in average spin rate at 2,322 rpms. But in one inning of an April 30 start in Texas, Bauer’s average spin rate surged while his velocity remained steady. He came close to hitting 2,700 rpm with a fastball — more than 300 rpms above his average. Bauer was asked after the game if he had used a foreign substance in that inning, and he said simply, “No comment.” He did acknowledge testing different substances in the lab at Driveline Baseball in Kent, Washington, where he trains and researches in the offseason. Driveline Baseball has tried to make it easier to measure spin rate. It released a metric in November 2016 called “Bauer Units,” a measure for spin divided by velocity. That allows us to look across teams and isolate which players might be generating spin more than others. And some of the most analytically driven teams seemed to valued spin more as soon as Statcast began measuring. Raw spin rate generally increases with velocity, but it’s the spin-to-velocity (rpm-to-mph) ratio that is so crucial to determining pitch movement. For instance, a high-velocity fastball with just average spin will not have as great of a rise effect as a lower-velocity, higher-spin fastball will. The ideal fastball is high-spin, high-velocity, like that of Justin Verlander. The Astros ace ranks second in baseball in vertical movement of his fastball, at 11.2 inches, with an average velocity of 95 mph. His fastball generates 29.4 percent whiffs per swing, seventh in baseball. It’s that rpm-to-mph ratio that is considered difficult to improve in fastballs by those who, like Bauer, have experimented in lab settings. In recent seasons, the Astros added spin outliers in Verlander and Ryan Pressley, who rank fifth and 10th in raw fastball spin rate and fifth and 16th in Bauer Units. (Bauer ranks 162nd out of 348 pitchers in Bauer Units.) The Yankees acquired Aroldis Chapman and Sonny Gray. The Dodgers made a significant investment, three years and $48 million, in elite spin-rate artist Rich Hill after the 2016 season despite his lengthy history of injury and inconsistency. The Dodgers, Astros and Yankees rank first, third and fourth in Bauer Units this season. And since 2015, those same three teams lead in Bauer Units added, suggesting that they better prize and/or teach the skill. All three teams declined interview requests on how they evaluate and develop spin. 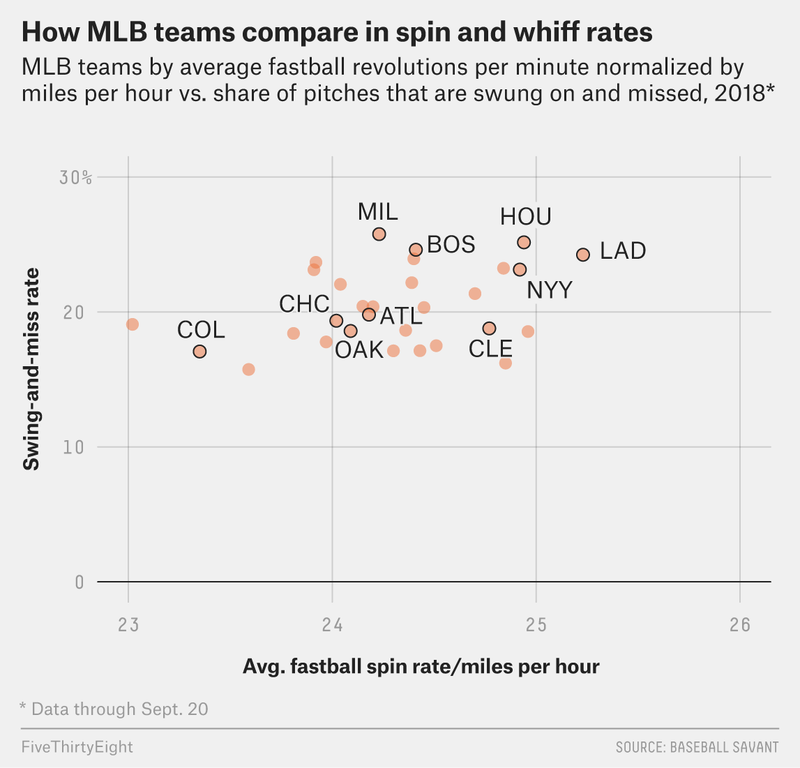 Which MLB teams are prizing spin? Eno Sarris found for The Athletic that pitchers joining the Astros have enjoyed small spin gains on average, but not every pitcher has made gains. FanGraphs found that the Blue Jays, Yankees, Rockies, Tigers and Astros added the most spin to new arrivals, often modest gains. Gerrit Cole of the Astros and Clayton Kershaw of the Dodgers are elite pitchers who have made significant gains in spin. Only Jorge De La Rosa had a greater year-to-year Bauer Unit improvement on his fastball (+2.31 rpm/mph) than Cole (+2.01 rpm/mph), according to a FiveThirtyEight analysis of Statcast data through Sept. 20. Since 2015, Kershaw has added the most spin relative to velocity. His spin rate has increased from 2,217 rpms on average in 2015 to 2,388 this season despite his average fastball velocity falling from 94.2 mph in 2015 to 90.7 this season. That helped Kershaw rank fourth in vertical fastball movement among starters, or average rise, with 10.9 inches this season. Cole has always had one of the top fastball velocities in the game. The pitch averaged 96.6 mph for him this season1 after he posted a 95.9 mph mark last season. But his average spin increased from 2,164 rpms last season to 2,374 this season. Cole ranks 34th in rise (9.7 inches vertical inches) among 176 starting pitchers to have thrown 200 fastballs this season and ninth in whiffs per swing (29.3 percent). Cole ranked 127th in vertical rise on his fastball last season (8.8 inches) and 37th in whiffs per swing (21.6 percent), among 189 qualified pitchers. In May, Cole told me that he learned to release the ball differently after working with Verlander, changing the pitch’s spin axis by looking for “true rotation and hop” and “staying behind the ball better.” Cole said the Astros also worked with him on pitch usage and location. Astros manager A.J.Hinch said in a radio interview that Cole is throwing fewer two-seamers, a lower-spin pitch that is sometimes mislabeled by Statcast, and that Cole has made “subtle tweaks.” Cole did record several high-spin fastballs in Pittsburgh that seemed to be outliers, so baseball blogger Saul Forman suggested that the Astros might have simply identified an untapped skill. Cole finished this season fifth in baseball in pitching wins above replacement. Statcast technology is imperfect. Hinch is right in saying that Statcast doesn’t label every pitch correctly. And its Doppler radar doesn’t read spin axis,2 which means that Statcast does not differentiate between transverse spin — which is sensitive to Magnus Effect — and gyrospin, which is not. Transverse spin is front spin (for a curveball or slider) or backspin (for a fastball) that rotates around an axis that is perpendicular to direction of motion. Gyrospin is like that of a bullet or football thrown in a spiral. A gyrospin axis is in line with the direction of motion. Most pitches have an element of each type of spin. Still, of all pitches, the four-seam fastball has the most consistent spin axis, Nathan said, so it should be most accurate to evaluate via Statcast. Major league rules state that no pitcher may apply “a foreign substance of any kind to the ball,” but the rule is rarely invoked — you’ll often see MLB pitchers tugging at their caps or touching their nonthrowing arms on the mound. When the rule is enforced, the offense is usually egregious — like in 2014 when Yankee Michael Pineda was ejected and ultimately suspended for putting pine tar on his neck and then on the baseball. We reached out to the MLB Commissioner’s Office last week, but it declined to comment on whether the league is investigating high spin rates. Opposing teams can ask umpires to check for substances, but that’s a rare occurrence. Indians manager Terry Francona actually apologized to Hinch in May for the spin-talk controversy on social media. Baseball has a long history of living with some common forms of rule-bending, such as sign stealing, scuffing baseballs and neighborhood plays. Even Bauer agrees that enforcing the rule isn’t the answer. MLB might have its own solution down the road: a tackier ball that is in development. The Indians were among the teams that tested the new ball this spring. Of course even a tacky ball could always be tackier. Players and teams will probably always be looking for an edge, particularly now that they can quantify the power of spin. Rapsodo tracking technology does that.